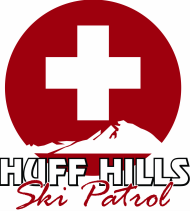 The Huff Hills Ski Patrol is an all-volunteer, non-profit organization that is affiliated with the Northern Division of the National Ski Patrol, which serves North Dakota, South Dakota, Montana and parts of Wyoming. Our team consists of nearly 50 dedicated, local members who are paramedics, nurses, doctors, police officers, firefighters, teachers and public servants. We provide free on-site emergency care and rescue assistance to customers of Huff Hills ski area. Huff Hills Ski Patrol was the 2011/2012 Outstanding Ski Patrol of the Northern Division and the 2012/2013 Outstanding Small Patrol in the Nation! Huff Hills' Ski Patrol with a few Bottineau Winter Park Patrollers at the annual refresher class held at Huff Hills, October 2014.